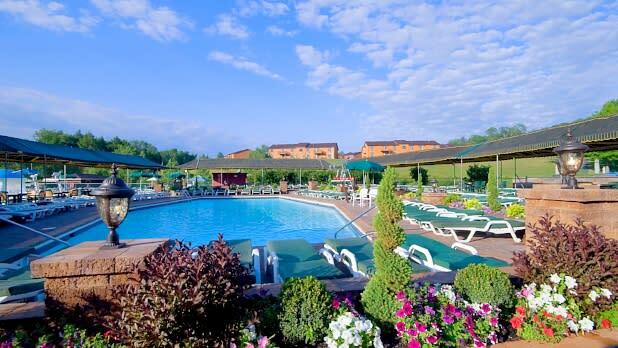 High on a hill in the Catskills, Sunny Hill Resort is as warm and cheery as it sounds. Guests describe it as "a cruise ship on land," with three family-style meals a day plus unlimited activities: golf, fishing, outdoor barbeques, a day spa, and nightly entertainment. There are incredible adventures too, like a Viking-themed obstacle course and monster truck rides through the woods. From themed spring getaways to ultimate summer vacations and spectacular autumn leaf-peeping, this family-owned resort honors a tradition of treating visitors like family that goes back about a century. Happy days for kids include swimming, rowing on the lake, feeding goats, organized games, and a big finish with fireworks on Friday nights. Rated a top-ten American family resort by Resorts and Lodges, Villa Roma perfectly blends luxury, convenience, and all-season recreation. Guests dine amid hand-painted murals, soaring chandeliers, and life-size marble statues—and choose from a wide range of seasonal activities: from horseback riding to bumper boat races, and ice-skating to downhill skiing. Head to the indoor sports complex for tennis, racquetball, and bowling or play the championship golf course with Catskill mountain views. Unwind in the spa, mingle at the piano bar, or chill in the ice-cream parlor. Check out special rates for themed weekends and packages that include fabulous meals, nightly entertainment, and unlimited fun. 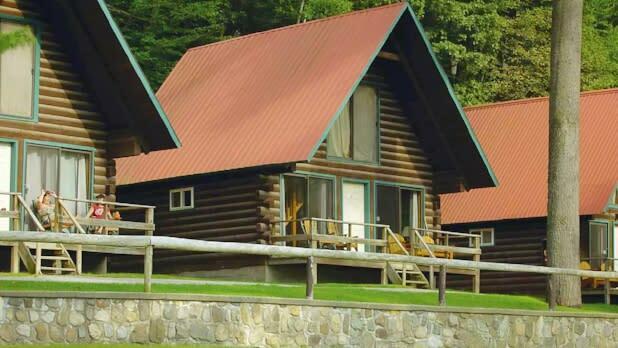 Whiteface Lodge has an authentic Great Camp ambiance along with modern luxuries and service. A rustic timber design complements the majestic Adirondacks landscape. Handcrafted furnishings, wood-beamed ceilings, stone hearths, and vintage antler chandeliers create a cozy kind of elegance. Amenities plush and practical include fine dining, a serene spa, in-suite laundries and kitchens, and 24-hour room service. Every guest is a VIP here—especially children, who enjoy the lakefront beach, canoes, and kayaks, heated indoor/outdoor pool, 56-seat movie theater, ice-cream parlor, bowling alley, game rooms, tennis and basketball courts, ice-skating rink, snowshoe trails, and evening bonfires with s’mores. They’ll sleep well. Picture-perfect on a private island in Lake George, the Sagamore embraces the natural beauty of the Adirondacks and the simple elegance of a bygone era. Popular for more than a century, the resort welcomes guests with rustic luxury and year-round recreation and relaxation, from spa treatments to swimming, tennis, and winter sports. Fish from the dock, tee off on the Donald Ross-designed golf course, or sail 19th-century style aboard The Morgan, a replica touring vessel. Savor sumptuous meals in casual or swanky restaurants. Guests age four to 12 can join the Kids Club for old-fashioned fun: nature hikes, scavenger hunts, variety shows, and programs from astrology to dining etiquette. 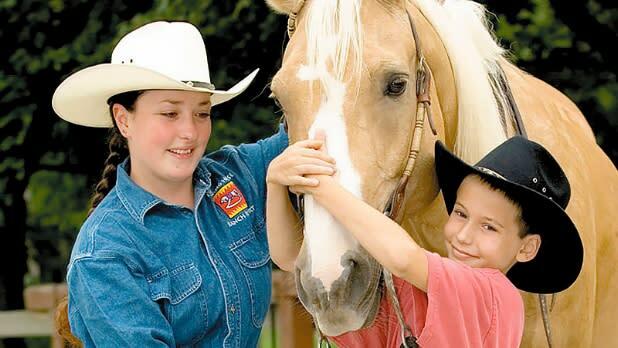 Friendly service and four-season fun are priorities at Ridin-Hy Ranch. 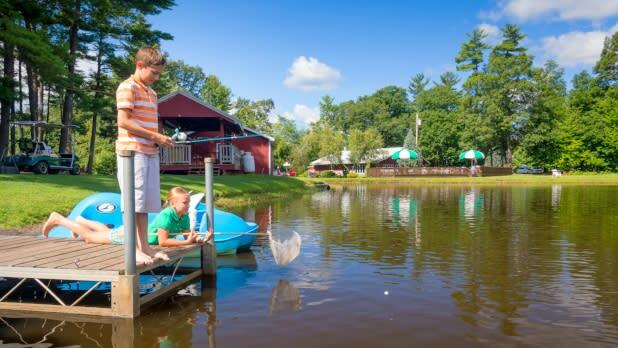 Set amid 700 acres in the Adirondack Mountains, this resort supplies everything that makes a friends’ getaway or family vacation great: hearty home-style meals, horse-drawn wagon or sleigh rides, fishing and boating on Sherman Lake, and fresh outdoor action from trail riding to water-skiing and winter sports. Clean and comfortable log cabins and a refurbished lodge welcome all with cozy seating and soothing views of the lake and surrounding mountains. All meals, snacks, and riding lessons are included, along with activities like campfire sings, hayrides, and cocktail parties. Feed carrots to the gentle horses, splash in the heated pool, or check out the nightly entertainment. 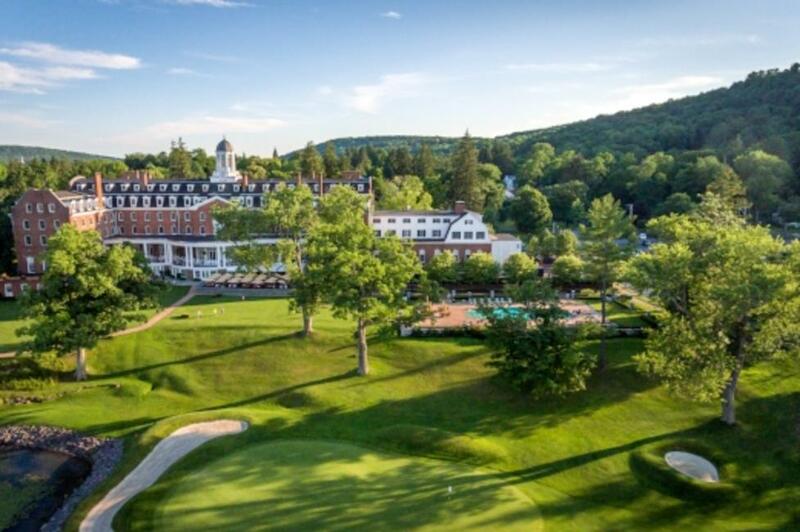 Situated next to Cooperstown’s shimmering Otsego Lake, the Otesaga blends old-world charm with modern comforts. Dine in fine style at four on-site restaurants or linger over afternoon tea on the lakefront veranda. Also overlooking the lake, the Hawkeye Bar & Grill serves great burgers and seasonal favorites year-round. 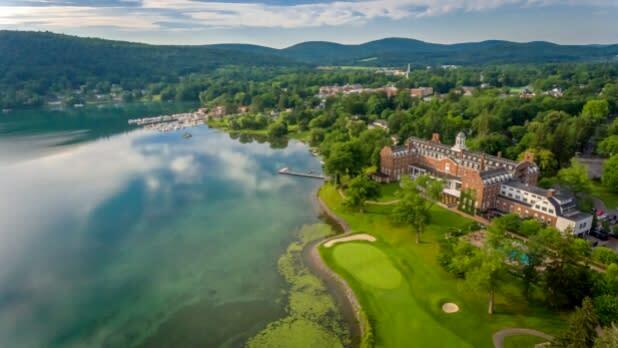 For fun, there’s swimming in the lake or heated outdoor pool, canoes, rowboats, tennis, fishing, and the highly rated Leatherstocking Golf Course. This family-friendly resort, open April through October, is just a short walk from the Baseball Hall of Fame, the Farmers’ Museum, the Fenimore’s whimsical folk art collection, and delightful Main Street shops. 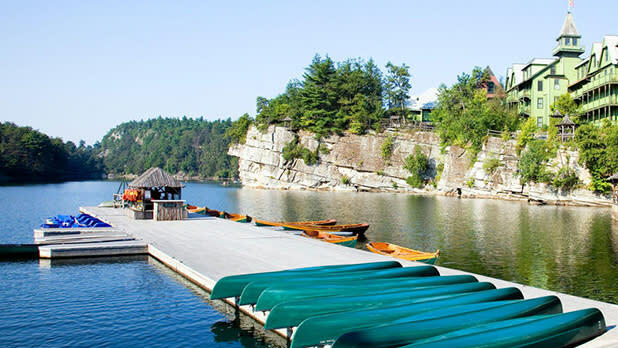 The grande dame Mohonk Mountain House, a 265-room Hudson Valley landmark built in 1869, sits high on a mountaintop overlooking protected forests and a private lake. Rated a world&apos;s best family hotel by Travel+Leisure, the four-season resort offers breathtaking views and fun for all ages with art programs, nature studies, paddle-boarding, golf, hiking, biking, and cross-country skiing. Relax on your private balcony, beside a cozy fire in the lobby, or at a yoga class in the award-winning spa. The dining room presents creative cuisine sourced from local farms and panoramic views of the Catskills. Stop by the old-time soda fountain for milkshakes, egg creams, or a late night snack. Families feel at home on the range just 90 miles north of New York City. Rocking Horse Ranch, in the scenic Hudson Valley, mixes easygoing Old West flavor with the comforts of a top-notch resort. Think spacious rooms with plush-top beds, meals created by graduates of the Culinary Institute of America, and rollicking entertainment from Wild West shows to magicians, comedians, and acrobats from around the world. Enjoy the ranch year-round with activities like trail rides, mountain tubing, or downhill skiing (lessons and equipment included). Little ones love the ponies, petting zoo, and bouncy castle. Don’t forget your bathing suits: There’s a private lake and indoor water park with a 250-foot flume. 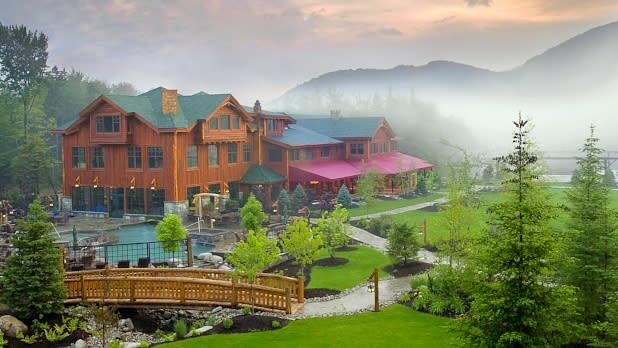 Adventures abound at Greek Peak Mountain Resort in the Finger Lakes region. There’s something for everyone and every season. Hope Lake Lodge has spacious suites, a waterfall-themed spa, and panoramic views. On-site restaurants with delicious options include a pub serving up wood-fired pizza, local wine and beer, and lively music. 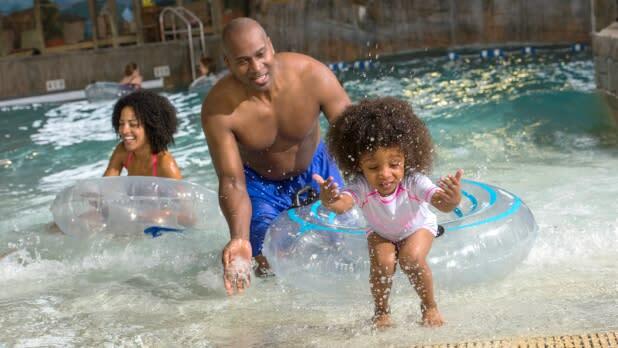 Play in the giant indoor water park where the temperature’s a perfect 84° every day of the year. The adventure center features year-round mountain coaster rides and zipline tours. Thrilling aerial challenges, bungee-trampolines, and a cool mountain bike park rock the green season. Winter thrills include fat-bike runs, a lift-served snow-tubing park, cross-country and snowshoe trails, and skiing the big mountain’s 40+ trails and terrain parks. 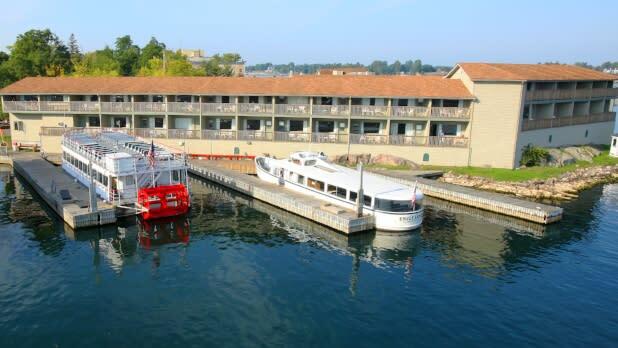 On a prime spot beside Alexandria Bay’s harbor in the Thousand Islands-Seaway region, Captain Thomson’s Resort presents splendid views from every room. Guests enjoy private balconies overlooking the St. Lawrence River and Boldt Castle, a heated outdoor pool, and warm hospitality, May through October. While not the typical all-inclusive experience, a stay here is still a one-stop vacation. Packages at this family-friendly resort feature waterside breakfasts, dinner, and drinks at the adjacent restaurant, castle tours with Uncle Sam Boat Tours boarding right next door, and a perfect location that’s just a short walk from shops, fishing piers, and other attractions.